Best Is Yet To Come is the awe-inspiring new album from seminal UK soul / R&B star Tony Momrelle. 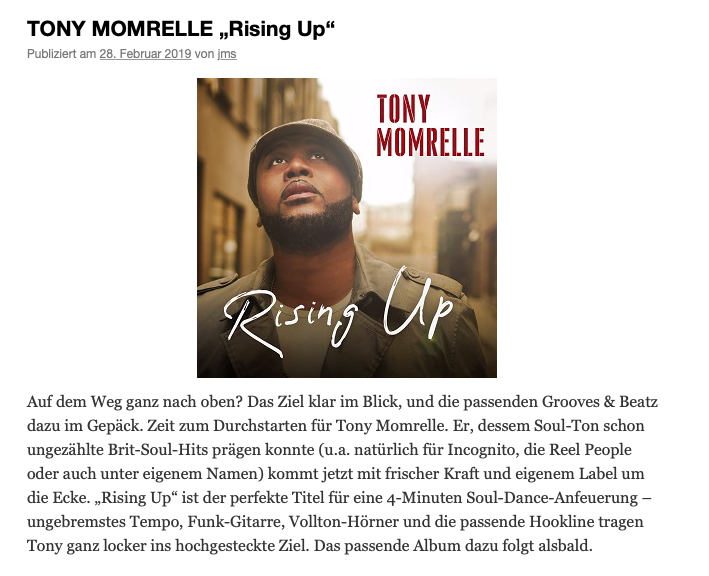 Fresh from the success of the new single ‘Rising Up’, described by SoulTracks as “an instant classic” and supported by Trevor Nelson on BBC Radio 2, Tony Momrelle returns with an exquisite new body of work that represents a decisive moment in his solo career. Best Is Yet To Comeis arguably Momrelle’s finest album to date, truly demonstrating his exceptional prowess as a songwriter, as well as showcasing the outstanding vocal ability for which he is widely known. Now with Best Is Yet To Come,Tony Momrelle has channelled his inimitable talent into his own solo project, the result of which is an album that clearly positions him as an equal and contemporary of the luminaries with whom he has collaborated. From the heartwarming optimism of the title track, to the disco funk of ‘You Got It’ and the smooth soul sound on ‘We Searched For Heaven’, Momrelle presents a vibrant and diverse canvas of songs that bring out the very best of his talent, leaving the sense that Best Is Yet To Comehas something for everyone to enjoy. There are however vital elements running through each track that unify all: the sheer quality of songwriting and the unique, powerful tenor vocal that only Tony Momrelle himself can deliver. A listen to the album will allow the music to speak for itself! Click on the images below to read the reviews. A cascade of worldwide tours, TV/radio performances, and songwriting sessions have filled the three years following the initial release of Tony Momrelle’s debut LP ‘Keep Pushing’. The remainder of 2018 signals full steam ahead, as Tony puts the finishing touches on the forthcoming record and graces festival stages all over the world throughout the summer, with concert dates scheduled in Russia, Italy, Latvia, Scotland and Luxembourg. Love Me Again is the new single off of Keep Pushing - the Deluxe Edition, released February 3rd 2017! Fresh from the success of three sell-out tour dates supporting the legendary Earth, Wind & Fire, Tony Momrelle releases the Deluxe Edition of his latest album Keep Pushing. Tony Momrelle releases his third single off of Keep Pushing, the upbeat and up-lifting All I Need.